Blue blocking glasses may be a useful adjunct to medications for mania. Bright light is one of the most rapidly effective treatments for depression and may be helpful for depression even in people without a clear seasonal pattern (winter depression). A recent study suggests that the opposite may be true, that avoiding light may treat mania. The portion of the light spectrum that affects circadian rhythms the most strongly is blue light, which is why the GoLite, which only puts out blue light, is so effective in treating seasonal depression. The authors of this study examined whether glasses that blocked blue light might be helpful in treating mania. The idea behind light-blocking glasses is simple: light therapy reduces depression so it makes sense that dark therapy might help patients experiencing bipolar mania. “In 1998 researchers at the National Institute of Mental Health tested this idea in a bipolar patient who was rapid cycling by putting him in a dark environment for 14 hours a day. They found that the patient’s mood and sleep patterns quickly stabilized. A few years later, Italian researchers conducted a pilot study with 16 bipolar inpatients and found that patients who had received the 14-hour dark therapy for three consecutive days, in addition to their regular medication, experienced a reduction in symptoms, required less medication, and were discharged earlier from the hospital. While these studies pointed to the benefits of dark therapy, there were questions of how practical the technique might be outside of a hospital setting. A discovery in 2001 that the brain specifically uses the blue light wavelength to signal light/dark status suggested patients might also benefit from the “virtual darkness” created by blocking blue light. Recognizing the tools to achieve this were already in place (welders have long made use of blue-blocking [also known as amber lenses] safety goggles to shield their eyes from intense blue welding sparks, and the goggles are known to increase visual clarity in the outdoors), Phelps began sending patients with bipolar disorder home with blue-blocking glasses. 24 hospitalized patients with mania, who also received usual anti-manic medications, were randomized to wear blue blocking glasses (BBs) or clear-lensed glasses from 6 p.m. to 8 a.m. for 7 consecutive days. The glasses were taken off when the lights were out. The study looked at the impact of this intervention on physical activity measured with actigraphy (you probably carry one of these with you since most smart phones measure physical activity this way) and daily ratings of mania by clinicians. Less medication was needed in those who wore the blue blocking glasses. Mania scores were significantly lower after 3 days of BBs and continued to improve through 7 days. There was a very large effect size (number needed to treat (NNT), >1.5). NNT is one of the most useful ways of assessing the impact of an intervention. The smaller the number the greater the effect of the treatment. To put this finding into context, the NNT in all trials of atypical antipsychotics for mania was 5. In other words, in this one small study, BBs were much more effective than atypical antipsychotics. 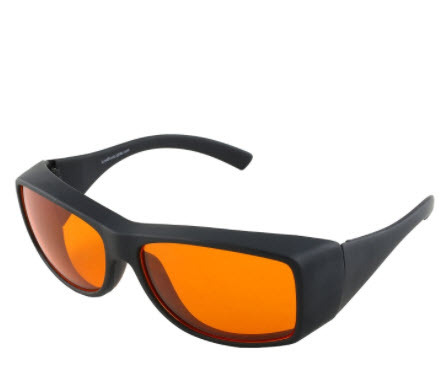 Wear these glasses from 6 pm to 8 am, except when you are sleeping or going to sleep in a dark room, be sure to wear them when you are using a screen (smart phone, TV, computer screen) as this is a significant source of blue light exposure. There are two sources of these glasses, our preferred source is from LowBlueLights.com. Another source is a set made by Uvex and available on Amazon at a much lower price. These are, however, pretty uncomfortable and I suspect if you start with them and they work you will want to switch to a pair from Low Blue Lights. Blue blocking glasses for those who wear prescription glasses. Blue blocking glasses for those who don’t wear glasses.